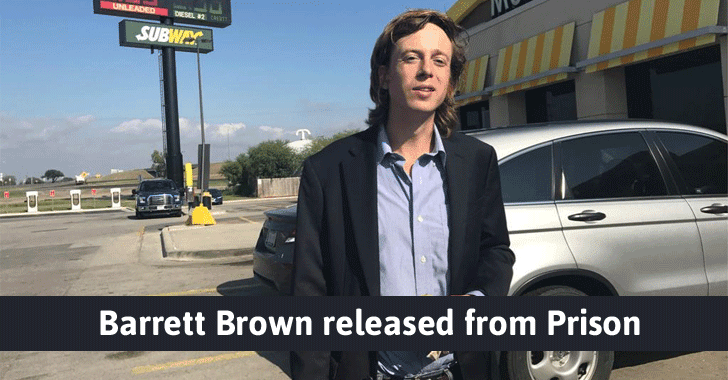 Barrett Brown, a journalist, formerly served as an unofficial spokesman for the hacktivist collective Anonymous, finally walked free from prison on Tuesday morning after serving more than four years behind bars. The Dallas-born investigative journalist was arrested in 2012 from his home while he was in the middle of an online chat after posting tweets and YouTube video threatening revenge against an FBI agent. Brown, 35, initially attracted the law enforcement attention in 2011 when he shared a hyperlink to an IRC (Internet Relay Chat) channel where Anonymous members were distributing stolen information from the hack at security think tank Strategic Forecasting or Stratfor. The hack allegedly exposed 200 gigabytes of data, which included email addresses and credit card information from Stratfor clients, including the US Army, US Air Force, and Miami Police Department. Originally facing sentence to more than 100 years in prison, Brown was convicted in January 2015 under a plea agreement with prosecutors to almost five years in jail and nearly $900,000 in restitution and fines. The two and a half years he has spent in pretrial confinement after his arrest were credited toward his total prison sentence. Brown eventually pleaded guilty to three federal counts of obstructing a search warrant, making Internet threats and being an accessory to unauthorized access of a protected computer. According to the Department of Justice, sharing the hyperlink was a crime because "by transferring and posting the hyperlink, Brown caused the data to be made available to other persons online, without the knowledge and authorization of Stratfor and the card holders." On Tuesday, Brown was released from the Three Rivers Federal Correctional Institution in San Antonio, Texas, where he continued his work as a writer over the past year. "Jailed since 2012 for his investigations, #BarrettBrown has finally been released from prison. Best of luck in this very different world." Meanwhile, the whistleblower site WikiLeaks also published more than 60,000 emails from US private intelligence firm HBGary to celebrate Brown's release. Hacktivist collective Anonymous initially obtained the emails in February 2011, but WikiLeaks published them in the form of a searchable database on Tuesday. Among other things, the leaked emails discussed targeting journalists and governments.